A wise character once passed along the sage advice, "Just keep swimming." 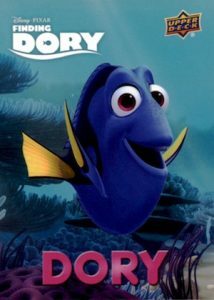 That was said by Dory, a lovable, but amnesia-prone, royal blue tang. Her story is on full display in 2016 Upper Deck Finding Dory. The simple release includes a total of 40 base cards that feature vivid colors and a variety of artwork. Each pack includes five cards which center on the story and main characters from the movie. As the sequel to the highly successful and popular Finding Nemo (2003), the new film, Finding Dory, understandably focuses more on the larger blue fish. Ellen DeGeneres returns as the title character and is joined by Albert Brooks as Marlin. New faces include Dory's parents, Jenny and Charlie (played by Diane Keaton and Eugene Levy), Ty Burrell as Bailey, the beluga whale, and Ed O'Neill as Hank, the octopus. Collectors can also find Funko figures that celebrate the film with Finding Dory Pop! and Mystery Minis. 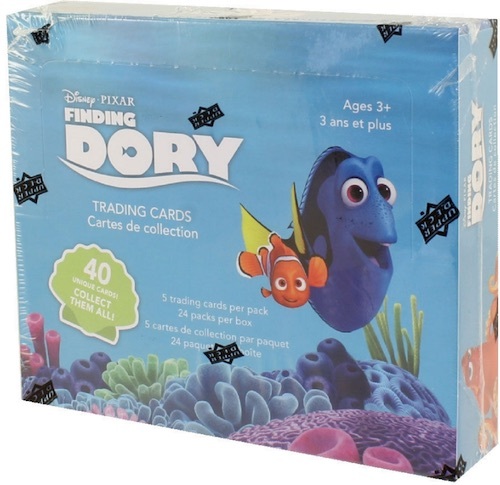 UPDATE: 2016 Upper Deck Finding Dory was switched from a sticker set to a traditional card release. 40 cards. Shop for base cards on eBay. P2 "What do we do? We Swim?" P3 "I am fluent in whale"
P4 Dory "Hooooow Arrreeee Yoooou? P8 Bailey "Just dial it in"